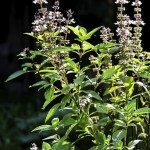 Sweet basil (Ocimum basilicum) is a favorite herb for containers or gardens. As a medicinal herb, sweet basil is used to treat digestion and liver problems, to detoxify the body, as a natural anti-inflammatory and anti-depressant, to treat headaches and migraines, and also for wound care and to treat skin conditions. Sweet basil is an ingredient in many natural beauty products. It is also grown for its many culinary uses. Fresh or dried, basil leaves are an essential ingredient in many Italian, Greek and Asian dishes. 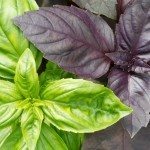 If you love to make fresh from the garden pesto or caprese salad, you may be growing a type of sweet basil known as Genovese basil. Genovese basil is a variety of sweet basil that originated in Italy. Its vigorous, large leaves have a sweet, slightly spicy flavor. 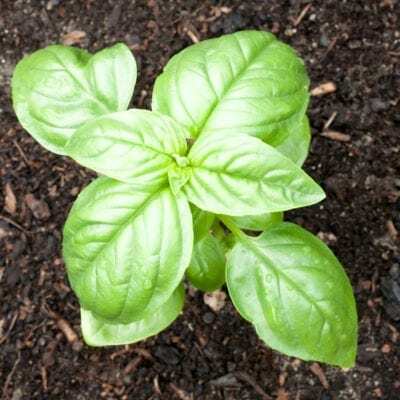 Genovese basil produces bright green, slightly crinkled leaves that can grow up to 3 inches (7.6 cm.) long. They are excellent for pesto, caprise salad and other dishes that require large, fresh basil leaves. In fact, Genovese basil uses are much the same as with any other sweet basil plant. Genovese basil plants can grow 2- to 3-feet (.61-.91 m.) high. Plants will grow in a full, bushy form if the tips are pinched regularly and the plant is not allowed to flower. Once basil plants produce flowers, all the plant’s energy is directed into flower and seed production, and the vegetative parts of the plant will stop growing. If Genovese basil plants do go to flower though, the flowers can be harvested and used in recipes that call for basil. 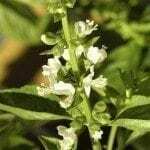 However, basil flowers are said to have a much more concentrated basil flavor and scent, so they should be used sparingly. Genovese basil is a preferred variety of sweet basil, not only because of its large, sweet leaves, but it is also slow to bolt in extreme heat and does not become bitter with age. Like other basil varieties, Genovese basil plants prefer a site with rich, fertile soil and at least six hours of sunlight each day. It is best to create a nutrient-rich bed for basil plants than to plant them in poor soil and rely on fertilizers to feed them. Fertilizers can negatively affect the flavor, scent and potency of basil plants. Genovese basil growing requirements are the same as any basil plant. Seeds should be sown indoors four to six weeks before the last expected frost date for your area. Genovese basil plants should germinate in about 5-10 days but plants should not be placed outdoors until daytime temperatures remain steadily in the 70 F. (21 C.) range. Genovese basil plants also are excellent for use in containers. In older times, basil was planted in window boxes or windowsill pots to keep flies out.